Historical Context: Begun in 1935 by the Social Security Act signed into law by FDR, more than thirty million Americans were registered for the economic security sanctions by 1937. From 1937 to 1940, payments were made in one-lump sums amounts with the first amount being seventeen cents. Following amendments in 1939, the payments turned into monthly benefits and increased. Following further amendments in 1950, cost-of-living increases were awarded to those who were receiving benefits. From 1950 to the present, benefits have increased yearly in response to inflation concerning the costs of living. Questions Asked: Social security number Name Date of birth Date of death State or county of residence (prior to Mar 1988) ZIP code of last residence, ZIP code of lump sum payment (Prior to 1939). Why This Database is Valuable: The Death Master File (DMF) from the Social Security Administration (SSA) contains over 80 million records of deaths that have been reported to SSA. This file includes the following information on each decedent, if the data are available to the SSA: social security number, name, date of birth, date of death, state or country of residence (prior to Mar 1988), ZIP code of last residence, and ZIP code of lump sum payment. The SSA does not have a death record for all persons; therefore, SSA does not guarantee the veracity of the file. Thus, the absence of a particular person is not proof this person is alive. To purchase the originals (with the Social Security number supplied) the request will cost $27. Source: Social Security Administration, Death Master File, December 2007. Take note of the years statewide vital-record-keeping officially began in each US state—that’s when counties started to collect birth, marriage and death information and report it to state offices. Some counties or towns kept stats earlier, and some were slow to comply with state laws, so check with your ancestors’ local government for record availability. which ancestor you would like to know more about. It is wise to select one direct-line ancestor rather than trying to research several at a time. This way you can be sure that you do not get side-tracked and become discouraged or miss important details. You will want to be sure you enter important details and sources into your PAF 5.2 database, or one of your choosing. We recently discussed the importance of entering information onto extraction forms, and we even included a link in the last post to several of my favorite free extraction forms. Keep in mind also that as you search, you may not find records on your ancestor. You may find that you are only able to document a death and not the birth. It is important to become familiar with the spouse and siblings of your ancestor in case the documents that you need to find the previous generation name these individuals instead. I have used my collateral line many times to link back to the previous generation. We are going to move next to our next phase of research. We will focus the next several posts on specific records, how to use them, and where they can be found. We will begin death records. Hopefully as you commit to following this process, you will find success you have not thought possible. I began my own research with very little details. I have been able to find a great deal. I will not live to complete all the books that need to be written to preserve all I have found. I am hoping that by sharing what I have learned, you too will discover enough to satisfy your curiosity about you own heritage. I hope you will also preserve it for future generations. I firmly believe society today would benefit from the stories of faith and courage that are waiting to be told. We have the power to change the tide, one story at a time! 1. Conducted oral history interviews. 2. Gathered photographs and historical documents and digitized them. 3. Uploaded the items above to your free Heritage Makers account for safe keeping. 4. Learned how to fill out a Pedigree Chart and a Family Group Sheet. 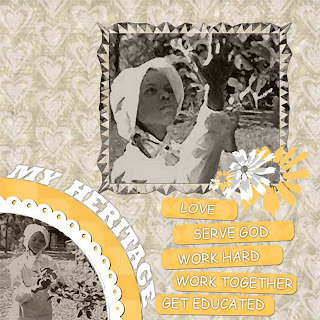 Now you are ready to learn how to locate resources which document the life of an ancestor. Before we proceed, there are a few extraction forms which will help you keep track and be able to see all the details you will find on public documents. Using extraction forms will help you see what information is still needed and keep you from duplicating you research efforts. People tend to get a little lax when it comes to using extraction forms, but they have enabled me to focus my time and resources, and I have found much success in locating resources which I had no idea existed. I have linked my favorite types of forms below. They are available free at Family Tree Magazine. The following are the steps to add a link to photos, sound, and video files to PAF 5.2. To add multimedia to this individual's file, click on the field next to the Contact field that has an image of a camera. Click Add to insert a new piece of multimedia. Click the down arrow underneath the label Image Type. Select the type of multimedia you will insert (Photo, Sound Clip or Video Clip). Click Browse to find where the multimedia is saved. Add a caption and a description for the multimedia, which will be used in a slideshow or a photo album. Click OK when you are finished. You can add more than one piece of multimedia for each individual (click Add), change the order of the multimedia (use the Order arrows in the middle of the screen), or edit the multimedia (click Edit Photo). When you have finished with making any adjustments that are needed, click Save to exit. When you create a slideshow, photo album, or book to share, any multimedia that has been linked can be made accessible or included quickly. You will want to stay in the habit of digitizing and adding multimedia right away so it does not pile up and overwhelm you. If you have never digitized any of you photographs, documents, etc. , do a little at a time. Do not try to eat the whole elephant at once. Now that you have begun the PAF 5.2 family history software database, you can digitize all the obituaries, birth and death certificates, and any type resource that you have to document your ancestor. These resources can be scanned and linked to the individual in your PAF file. I upload copies of all my documents in my Heritage Makers account where they are safe and easy to locate. When I put together parts of my family history for publishing, all I need to do is drag these documents and pictures and drop them onto the pages of the books. This way posterity can have the thrill of seeing the document along with the photos and history at the same time. stay organized and not become overrun with paper. Personal Ancestral File 5.2 or PAF 5.2 for short is the best free database available. You can find 100% quality support in learning to use it. DOWNLOAD HERE. You will be able to enter the names of your family, both living and deceased. You will be able to add your findings and document sources. With this program, you can print Pedigree Charts and Family Group Sheets with photographs. PAF will create books and slide shows. The greatest benefit to using this program will be that it will help you determine what information you have and what is missing without sifting through piles of paper. It is a relatively easy program to learn and you can share you file with family members easily. If you feel so inclined, you may visit the following site and take free tutorials on the features you are most interested in learning to use: CLICK HERE. From the menu on the left on the site above, PAF Tutorial, you can view demos. You may want to first watch a demo on how to download and install the program. Then you may want to see demos on how to create a new file and how to add individuals. I have found some family historians who shy away from using computer software to organize their findings. This is a grave mistake. PAF and other databases like it help to create the visuals which are needed to help direct you in your search. Without this form of organization, you will soon be too overwhelmed with your findings to sort out important details and leads, and it will be just as difficult for any on else who tries to help you. 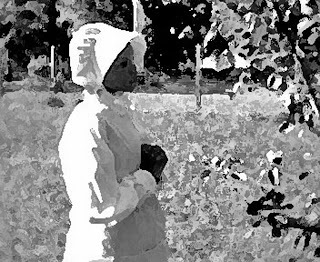 Family history research is a science, and we should treat it as such. Could you imagine a microbiologist refusing to use a microscope? Silly right? Well, so is the family historian who tries to keep all the facts in his head or in folders, refusing to computerize! I do not want to sound harsh here. I have been there myself. After all the boxes and filing papers only to find several duplicate copies of the same information that I was just thrilled to rediscover each time, I became more disciplined. I found myself having greater focus and more success in less time. So do not be afraid to learn something new. Take the time now. We will wait while you begin. Each time you discover something new, stop then to record it. We are on the road to discovering an arsenal of information. Each piece of the puzzle will bring into full view a little more about a person who is anxious to be discovered by you! One of the least understood tools is The Family Group Sheet. You should generate two Family Group Sheets for the person whom you are researching. We will attempt to explain here why this is your secret weapon in breaking down "brick walls." The term "brick wall" is used to refer to what it feels like you have to pass through to uncover resources on you ancestor. If you would like to print out a Family Group Sheet to refer to, CLICK HERE. 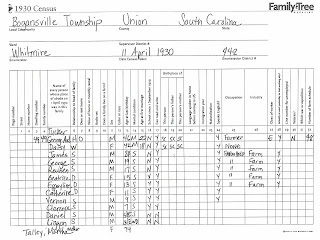 Fill out one Family Group Sheet with your ancestor as a child. Fill out another Family Group Sheet with you ancestor as a parent, if this applies. You should make your best attempt to fill out both sheets completely with spouses, siblings, parents, children, events, and places. The number one mistake of many whom I have assisted is that they do not trace spouses, siblings, parents, and children. They run out of resources and get stuck in their research for many years. When they gain the courage to begin anew, I always request to have them produce a Pedigree Chart and Family Group Sheet. We will proceed to identify resources which may document the lives of the entire family. If you take the time to complete this step in the process that we are unveiling, you will be happy in the long run. and appear together in public documents that were generated in their lifetime. Many times when records are indexed, such as land records and wills, you will not find your ancestor's named indexed. The record may be indexed under the name of another relative. When you look at the actual document, you ancestor is named, along with other members of the family group. At times, you will need to search different documents indexed under other family member's names. You may end up searching for the previous generation using a sibling or cousin of your ancestor because your ancestor my not have sufficient resources. The Family Group Sheet is also most beneficial because it helps you to narrow your search down to the specific time period and place(s) your ancestor lived. This becomes vital information when you discover that even though your ancestor never moved, county boundaries changed and you are having to search holdings in more than one district. This all may sound confusing. Do not worry. We are building this bridge one step at a time. You can go your own pace here. Just get those Family Group Sheets filled out, and we will take it from there. A pedigree chart gives information about yourself, your grandparents, and your great grandparents and so on. Usually, a pedigree chart covers four or five generations including yourself. I recommend you start by trying to identify up to your great grandparents on both your mother's and father's sides. It is very helpful to keep a pedigree chart on hand for quick reference. This visual will help you as you search for resources which existed during the time and in the places your ancestors lived. When recording names, use the maiden name for females. The proper way to record a date would be first the day, then the month, then the year. For example: 5 November 1878. Places are recorded by listing the city, state, county/parish, then the country without abbreviating. For example: Columbia, Richland, South Carolina, United States. Do not worry about ancestors or details which you are lacking at this stage. As you follow the steps which will be shared on this blog, you will begin to discover information about your family you never thought possible. You are the most important connection to the past. The story of your life, hopes, dreams, and lessons learned are of the most value to your children and grandchildren, simply because they have known you. This record becomes even more precious to them when you are no longer within their reach. It is important for you to document every aspect of your life that you possibly can. Do not become overwhelmed. Start today. Little by little you will fill the annals of history and greatly influence the lives of those you love most. Keep in mind that they will not only be interested in specific details about your life, but they will also profit from knowing the reasons why you made the choices you did in your life. Do not be discouraged if it seems that no one is interested in your history or that of their ancestors. Many of us have made the mistake of taking for granted those we have around us each day, however, we would be hard pressed to find those who have lost loved ones who no longer long for the influence those loved ones had in life. The opportunity to speak from the dust, so to speak, lies in you ability to leave a legacy today. Purchase a notebook or journal and put it near your bed. Every night, write down the experiences that you had that day and how you felt and handled opportunities that came your way. It is necessary to do this each day because even we who have these experiences forget them all too soon. Tell about the trials of your life and how you overcame them. Speak to them on the words of those pages as if they were hearing firsthand. Tell of the joys you experience. My own journals have become a great source for stories that I want to preserve for future generations. I do not want my own story to become the most longed for by my posterity. I hope that I can anticipate what things they will want to know most about me and make my story available to them. Perhaps you would like to take the challenge of writing and publishing a 21 page story about your life. With the help of this LIFE STORY MAP, you can write your life story as you answer basic questions about your life. Once your story is complete, contact me and I will show you how to turn it into a cherished family heirloom. "Women of Strength: 7 Generations"
You probably have at least a few treasured images by now. It is important that these photos be kept in a safe place where you can access them easily. Pictures fade and can deteriorate over time. After having a computer to crash, and cd-roms to malfunction, I was desperate for a better way to safeguard my photos. I started using a flash drive until it was full. Before I went to storing on the external hard drive, I found Heritage Makers. Now I do not have to tote anything around. I have access to my photos anytime and everywhere I go. My family even can go online to my account and download photos which are the same quality (usually 300 dpi) that I uploaded. Now when I fill my digital camera, I create an album and upload the jpegs, and I have an Premier account which includes unlimited storage. You can scan old photos and upload them by category. You can start your own basic account password protected for free today. Just go to Heritage Makers. Click on the link at the top right that says "Sign up for free." Activate your account and add photos right from your computer. We will discuss how to stay organized as you research your family history. How many of us have photos just laying around without captions? 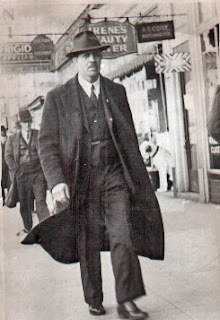 I received this photo of my grandfather, Emory Wallace Vance, from my cousin Bill who just recently passed away. He went through all his photos and gave them to extended family who would recognize them and cherish them. I had never seen this photo before. My grandfather was a banker. He is walking downtown Columbia, South Carolina. I do not know the year. The photo had faded and was damaged and had white spots. I taught myself how to restore photos and have since used this picture in the book, "Brought Home by a Story." Did you know that you could actually request a photograph to be taken of an ancestor's grave for free? Volunteers go out and take the photo and upload it to a website called Find A Grave. I registered and looked for the cemetery then searched the graves in that cemetery for my ancestor. If my ancestor is not listed, I add him and then request a photo. I do this all the time. 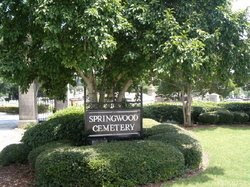 You can also just search for your ancestor by name if you do not know the name of the cemetery. It is great to actually see these photos of places too far away to travel. Most recently, I requested the photo of the grave of Burwell Chick to be added. In our first post, we discussed how we could find valuable information by interviewing the oldest living relatives. As we meet with these relatives to find out information about our ancestors, we should also determine if they have in their possession any photographs, obituaries, birth or death certificates. In this process, we will go through various types of records that might exist and how they can be used in to aid research. At this point, you can pretend you are on a scavenger hunt for documents. Remember your digital camera, especially so you do not have to return photos or documents. This format is easy to store and preserve. You want to be careful in handling old photos and the like. Also, be sure to get help in identifying any names or faces you do not recognize. The oral history interview is the greatest source for researching your family history, and this checklist of secondary sources are the next best thing. Remember to be sure to show courtesy to the family member granting you the interview and sharing information. Be sure to take plenty photographs of the interviewee and his or her home. You just might be surprised where the clues they give you will lead. Successful interviews have become success stories for me. I have transcribed and published interviews and included photos and documents provided. I have several cherished recorded interviews with loved ones who have passed on. I have found great comfort in the fact I was able to extract and preserve their memories before they were lost to us in this life. We will address next what you should do with all this information you are gathering. Google Toolbar is a great resource for finding information online. I found this tree in a beautiful park not far from my house. 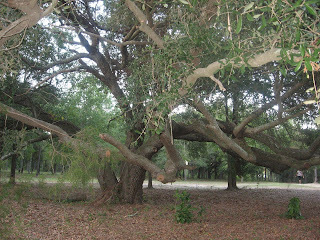 It's branches reach so far out, and they are very close to the ground. I could not walk under them. I wondered what this tree would say if it could talk. My thoughts turned to the people in our lives who have been around long enough to give a perspective on life which we could find useful. They can help us to understand a bit more about who we are and what life is all about. We just need to stop long enough to ask the right questions and listen. I have been very fortunate to have been able to formally interview a few such people. I have been able to find clues which helped me to discover the names and whereabouts of ancestors. I have also been blessed to discover how much I have in common with my forbears. Every time I get stuck in my research, I find someone to interview. I ask about names, dates, and places, but I also let the person I interview tell their stories. I record and transcribe these interviews because I find myself referring to them many times. Even when my subject insists he or she does not remember much, they eventually are able to recall important details sometimes days later. If you do not know where to start or even why you should start, interviewing your oldest living relatives is the first and most important step. Remember that even second interviews have been successful in uncovering more information.